Real Madrid forward Cristiano Ronaldo announced the birth of his son on his Facebook page Sunday, saying, "It is with great joy and emotion that I inform I have recently become a father to a baby boy...As agreed with the baby's mother, who prefers to have her identity kept confidential, my son will be under my exclusive guardianship." It is in order first of all to offer congratulatory words to the new and young father. He has sprung this of course to his fans across the globe, just like Michael Jackson did the birth of his second son, Blanket, the identity of whose mother is still not known. Already there are widespread speculations on the Internet about the sexuality of the world's most expensive player. To some, this unusual style of bringing a child into the world and deliberately keeping the child away from his mother smells of a surrogacy arrangement by a gay couple. Perhaps towards the end of his career, Ronaldo might do a Ricky Martin and jump out of the closet. Although there is no credible correlation between having a baby through surrogacy and homosexuality, it is difficult not to wonder why this 25-year-old player would opt for such a child-unfriendly arrangement. This question is particularly important, considering that his job as a footballer entails a lot of travel and time away from home. One would have thought that it would have served the child's interest better to stay with his mother. 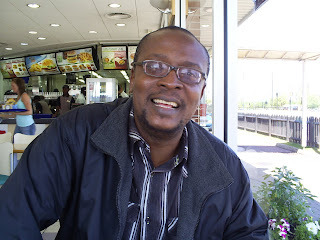 Charles Novia is a trained Dramatist, Actor, Director and Film Producer. One of the key players in Nollywood, Nigeria’s phenomenal film industry. In this interview for Next (Nigeria) and Nollywood Focus, Novia talks about his childhood years, his professional beginnings, current work and future projects. Prior to studying Dramatic Arts at the University of Nigeria, Nsukka, did you have any training or experience in the Performing Arts? Yes, I was sort of a child actor in Benin. I grew up in Benin. At an early age of about seven, my talent was discovered by a school teacher, Mr. Dickson. He realised I was good in acting. One day, he gave me ‘The Wizard of Law’ by Zulu Sofola, and asked me study the part of the lawyer. We performed the play during school assembly. That kind of fired up my zeal. At the age of ten I began acting in the NTA Benin Children’s Time. I did a couple of adult plays with the Bendel Playhouse. My acting was honed by the environment around me. Bendel State had a lot of artistic and creative energy flowing. That early start motivated you to take a degree in Dramatic Arts? I had grandiose dreams about going into the arts. At the time, if you were not a lawyer, accountant, or doctor you were not regarded as anything. So, I was very thrilled when a reverend father who just came back from the United States, came visiting us. I asked him what he read in America and he said he did a Masters in Theatre Arts. That sort of triggered something in me. Theatre Arts? Is there something called Theatre Arts? He said, ‘yeah.’ I said, ‘you mean you can actually go to school to study acting?’ and he said ‘yeah.’ I decided right there and then that’s what I was going to study. My mother laughed it off, but it stuck in my head. Good thing your parents did not interfere with your career choice then? Not that they didn’t try! My father, particularly, was initially against it. He really wanted me to go into Law. Along the line, when he discovered I could write very well, he then wanted me to study Mass Communications, to become a journalist. When I got my admission from UNN, he was like, ‘Law?’ I said, ‘no, Theatre Arts’. His face was a big mask of disappointment. Anyway, after one year, I came home with reports of what I had done. You remember, Nnorom, I did your play, ‘A Tasty Taboo.’ I also played Yekini in Esiaba Irobi’s ‘Hangmen Also Die’ and Senator Arikpo in ‘Nwokedi’. I played Elesin in ‘Death and the King’s Horseman.’ I was also in Godfrey Okoro’s ‘Fruits in the Wind’ - the first play to highlight the problem of cults in universities. My father was happy. Unfortunately, he died before he could see the fruits of his investment. I think I was born for this. Upon graduation, did you know, even then, that you would go into film production? I was at crossroads. I thought I would stick with the theatre. There was this guy, Greg Mbajiorgu, he actually did a one-man show, ‘The Prime Minister’s Son,’ and I saw that and I was like ‘wow, I could be doing this.’ But in 1998, I decided to go into films. Nollywood at the time was at the cusp of becoming something big, so I decided to show my stuff. Just before then, I played Tasso in Goethe’s ‘Torquato Tasso’ at the Goethe Institute, Lagos. It was amazing, but as I took the curtain call, it was sort of sad, my spirit told me I wasn’t coming on stage anymore. That was it. I crossed over to Nollywood. Why have you challenged yourself to make successful films without Nollywood’s superstars? I did not use Nollywood’s well-known stars for my first two movies. The marketers kept calling me to say, ‘your movies are good o, but they no dey sell because you no dey use faces.’ So, I started to use some of the known faces, and I tried to give them a new orientation; to follow my style. As time went on, they became larger than life in terms of discipline. In 2003, I made ‘Missing Angel’ – my biggest-selling movie to date, over a million copies. I used an as yet unknown Desmond Elliot, and it became his breakthrough movie. There were no stars in that movie. Then four years ago, I said, enough is enough. The high of a director is the believability of his movie. I don’t get that when I use a Genevieve or a Ramsay. The story might be good, but people always say, ‘ah, na acting’ because they have seen those same people in five hundred other films. So, I thought I just have to use new faces. The suspension of disbelief must be paramount. A Brad Pitt would go through the rigours and motions of characterisation because he respects the director. I mean, here I am working with a star and he has fifteen other scripts waiting for him. He will be on set and other producers will come there, clapping their hands saying ‘hurry up, you have to finish tomorrow and start on my film.’ So you are not getting the right commitment. There is a lot of arrogance. Moreover, you can read the mood of the buying audience. They want change, to see new talent and value for their money. Describe the state of Nollywood today. Nollywood started as ‘molue’( commercial bus). In the rickety molue, Fela said sixty-nine standing, twenty-nine sitting. At the initial, experimental stage, a few people got in; the twenty-nine sitting. When it started making money, sixty-nine got in and it became overcrowded. A lot of crazy ideas! Mediocrity and professionalism clashed, and mediocrity sort of became the order of the day. The bus veered off the road and hit a pole. The survivors are coming out of the bus. Professionalism will now take its own bus, and mediocrity will enter its own bus. The whole world has been saying Nollywood is a phenomenon, but hey, it’s more quantity than quality. It’s more Onitsha market literature at its lowest level, than cinematic artistry at its highest level. It is more of ‘let me do twenty movies a year and make ten million’, rather than make one movie and make a hundred million. So, Nollywood is at crossroads, but there is hope. I see hope because in the past year or so, I have seen a brain gain, I call it a brain gain from abroad. People have gone to film schools abroad and they are coming back to explore the terrain. They are bringing new ideas. They are bringing a measure of professionalism. Some of my colleagues are sort of antagonistic towards these ideas, but I always say, when the time comes, you can’t stop the movement. We are moving to a new direction where we can have professionalism at the highest level and mediocrity going to its graveyard. Have you considered turning any of Nigeria’s novels or plays into a movie? In 2006, I met with the late Cyprian Ekwensi and obtained the rights to turn one of his books into a film: ‘The Passport of Mallam Ilia.’ I am going to shoot that later this year. Given Nigeria’s rich folklore with colourful animal characters, is anyone doing animations in Nollywood at all? None that I know of, at least not cinematically. There was a guy though who made animations for TV commercials. Animated movies are lacking in Nigeria. Children’s films and family movies are lacking. Besides, animations cost a lot of money to make and the average Nigerian film-maker will not put his money into something with long-term benefits. They want things that will yield profits quickly, within three months or so. What will be the next big thing in Nollywood? We are seeing investment in infrastructure. In cinemas. ‘Figurine’ made about forty million naira in one month, playing in just five cinema houses. To make that kind of money through our traditional DVDs is very difficult. I think cinema is the future. Are you working on any movie at the moment? I am working on a biopic of Majek Fashek. ‘Majek’ will tell the story of Majek Fashek from his rise to his stardom to his decline and his struggle now. I’ve just got a venture capital firm to invest in it. I have been working on it for three years. At the risk of being immodest, it is going to be the next big movie Nollywood will see. I have done one other biopic before – on Pastor Adeboye. It was called Covenant Church. It was huge. ‘Majek’ is due for realease in December 2010. Note: This is an abridged version of the interview as published in Next (Nigeria). The full version of the interview will be published in Nollywood Focus in September 2010.